Dr. Michael Donohue recently relocated with his family to the South Bay after previously residing in Dallas, Chicago and Boston. He was born and raised in New Hampshire and graduated from the University of New Hampshire in 2003 with a BSc in Kinesiology with an emphasis on Exercise Science. He was accepted at the National University of Health Sciences in 2006 and while studying there he completed rotations at locations as varied as the Salvation Army, the National University of Health Sciences main clinic and a personal injury practice in downtown Chicago. 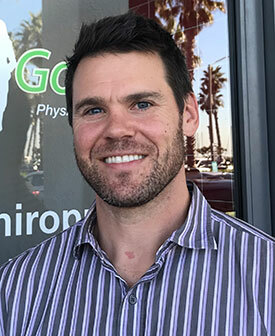 Following graduation in 2009 with a doctorate of Chiropractic he chose to practice at a Chicago clinic that specialized in the treatment of athletic injuries. As a life-long exercise enthusiast, the treatment and maintenance of athletes and their injuries was of particular interest to him. In 2011, he opened his own practice, Rehabilitation & Spinal Care of Rockford. The practice catered to the Northwest region of Illinois and served a diverse population with a wide-array of musculoskeletal and joint issues. The mission of the clinic was to blend the core concepts of his doctorate and undergraduate training to ensure a unique and comprehensive patient experience designed to heal and rehabilitate. Dr. Donohue believes that the keys to musculoskeletal health are the maintenance and restoration of range-of-motion, the prevention of joint degeneration and soft tissue mobilization. He is extremely excited to join the Good Life family, a multi-speciality practice that fits his philosophy perfectly.